Emily and Spencer are talking on the phone. Veronica is passed out on the couch. Spencer ask Emily if she said anything more the ah being Sarah. Emily tells her Sarah just said she doesn’t think Andrew is the one who kept here down there. Spencer wants details. Emily doesn’t have them. Emily tells her that Sarah isn’t sure sure but she is pretty sure. Spencer still wants to know how Sarah knows it wasn’t Andrew. Emily tells her Sarah didn’t say. Spencer ask where she is. Emily tells her she is taking a shower and that she takes a lot of them. Spencer says she knows the feeling. Emily tells her that Sarah was trapped for over two years and that Andrew was in school with them the whole time. Spencer brings up the fact Mona was A and that never cramped her style. Emily says well Mona didn’t have someone caged up like a animal. Spencer says she knows and that you can’t ask for a hall pass to go feed your hostage. Aria refuses to cruise past it being Andrew no matter how much sense they try to talk into her. Aria says it has to be because she can’t go back to where they were. Hannah is all about going to school. Aria ask of Mona will go. Hannah says Mona’s mom took her out of town. Hannah doesn’t want to go down the is Andrew A or not rabbit hole with Aria and tells her she will see her at school. They hang up. Hannah rips the page in her yearbook with Andrew on it out. Sarah is talking to Emily about her going back to school. Emily tells her that isn’t much left. Emily tells Sarah her mom said she will give her a ride home. Sarah says ok. Emily ask of she is ok. Sarah wants to stay there a little longer you know until Emily gets home from school. Emily says she will let her mom know. Sarah thanks her. Emily gives her a burner cell phone in case she wants to call or text her. Sarah is upset because of how she was talked about in the news. Sarah says they called her feral. Then she ask Emily if that is how she looked. Emily says more like a lost puppy. Emily goes to touch her and Sarah backs away. Sarah freaks out and Emily ask,her to have breakfast with her. Sarah says she thought Emily was going to school. Emily tells her she can go tomorrow. Sarah smiles. Ezra brings Aria a baked good of some sort. Aria tells him she is headed back to school. He ask her if she is ready for that. Aria tells him no. Ezra tells her to stay there and she can use the desk in the back. She can read, doodle or even alphabetize the spice rack. Aria thanks him. Spencer meanwhile is arguing with Alison over her lying liar of a father who you know lies. Spencer says Alison has to make him tell her. Alison says he looked right at her and told her there was no Charles in their family. Spencer says A just didn’t pick that name out of the air. Alison says A is for Andrew. Spencer ask why put the name Charles DiLaurentis right in front of us then so that they could find it. Alison says if Charles was a real person than her dad would be at the police station right now. Spencer has her doubts. Alison tells Spencer to leave. Spencer tells her she is going to talk to Jason. Alison wants her to leave Jason out of it. Alison says she doesn’t want anyone else hating her. Spencer ask her why she thinks that. Alison says because that’s how it works. Alison says she saw the sick place they were in and knew it was because of her. It always comes down to her. Spencer tells her it isn’t like that. Alison tells Spencer she thinks the same thing. Spencer tells her she doesn’t. Hannah is at school on her phone. She is apparently the only one who showed up. Dr. Sullivan pops up and tells her she is glad to see her there. She tells Hannah she called and ask if her mother told her. Hannah says she did. She lets Hannah know she works with the school counselors if she ever wants to stop by. Hannah tells her ok. Dr. Sullivan then tells Hannah to please stop by. Hannah says thanks. The bell rings and she heads off to class alone. Aria is looking at pictures she took on her laptop. She gets distracted by a doll in one of the pics and then by Andrew in some others. Aria ask the picture of Andrew who he is. She hears Ezra and shuts the laptop. Ezra tells her he has a tip for her is she doesn’t want someone to know she is hiding something from them don’t hide it. Aria says maybe she wasn’t hiding it and opens her laptop up. She ask Ezra who Andrew is…really. Aria says she trusted him and all she knows is what he told her. Ezra looks slightly uncomfortable. Ezra ask her what she wants to know. Hannah is talking to Dr. Sullivan about Andrew. Hannah tells her she thinks Andrews big win would be them not being friends anymore and it may have worked. Dr. Sullivan ask how. Hannah tells her there was something else going on. Flashback to his demented game he loved to play. Dr. Sullivan ask her how she feels about scheduling some time with her. Hannah wants it to be all four of them. She tells Hannah she can’t force them to do it. She tells Hannah if she can get them all to come to her office she will make time for them. Hannah tells her she will make it happen. Aria and Ezra are running a scam on Andrews doctor. Ezra is pretending to be cop. He finds out that Andrews place of birth is sealed. Andrew was adopted. Man they are really stacking the deck against him….still not buying it. Alison is walking along when she runs into Lorenzo coaching a kids soccer team. Alison ask about the girls soccer team. Lorenzo tells her they lost the supervisor for them so they don’t get to play. Alison says that’s to bad. Lorenzo ask Alison if she would like to volunteer. She ask for what. The girls soccer team leader. Alison thinks it’s a terrible idea that there are parents who would lose it if she was in charge of their daughters. Lorenzo tells her he will worry about that. Alison says she doesn’t take no for an answer, Lorenzo tells her not if it can be avoided. Toby is watching them talk through the glass. Sarah tells Emily she has to buy all new stuff because after a year went by her mom packed up all her stuff and gave it away. Sarah tells her it’s because her mom said she needed the space. Emily tells her she can have whatever she wants that fits and she even has some stuff in the attic. Pam ask Sarah why she ran away. Sarah tells her it’s because she couldn’t pretend to be happy and that everything was going to be ok. Pam tells her she is sorry and then districts her with clothes. Emily’s phone starts ringing. It’s Hannah. She apologizes for not going to school. Emily then looks out her window and ask Hannah where she is. Spencer is with Toby. Toby wants Spencer to talk to Alison about keeping away from Lorenzo. Spencer ask what Alison has to do with Lorenzo. Toby says nothing yet and he wants to keep it that way. Spencer ask why he thinks Alison is interested in him. Toby says he saw them together. Spencer says that’s Lorenzo’s business. Toby tells her we are talking about Alison. Spencer tells him people can change. Spencer says she helped him look for her. Toby says she did it for herself. Spencer says so then she is just going to go back to the same old Alison before all this happened. Toby says he wants to trust her but she does have quite the resume. Toby tells Spencer if she can say she completely trust Alison he will drop the whole thing. Hannah is outside Emily’s. Hanna tells her to get in the car they are going to see Dr. Sullivan. Emily refuses. Aria flies up and tells them that Andrew was adopted which means he could have been lying about his age. Hannah says so before he was a Campbell he could have been a DiLaurentis. Spencer is with Jason. Jason’s dad wants to sue a lot of people. Spencer says she wants to talk to him about their family. Spencer tells him when they were in that place they saw a name. Jason ask her the name. Spencer tells him Charles DiLaurentis. Jason tells her he doesn’t recognize the name either. Spencer gets a text from Hannah and says she has to go. Jason whispers the name. Spencer ask him what. He says Charlie and then he tells her that his dad was right Charles doesn’t exist. Let me guess imaginary friend? Yeah right…. The girls are in Sullivan’s office when Spencer comes flying in. Spencer says Jason told her who Charles was. He was Jason’s imaginary friend. Told ya. Arias ask why if he is just a imaginary friend why didn’t Alison’s dad just tell her that when she asked. Spencer says yeah why not. The girls know Charlie is real. Aria wants to tell Sullivan everything. Emily gets a face chat. She thinks it’s Sarah but it’s really A. He has knife. The recording disappears and a message shows up on the screen. “Mention me and someone dies. You have 30 seconds to leave that room.” A timer pops up and starts counting down. When Sullivan comes back out of her office the girls are gone. Emily and the girls go flying up her stairs. They get upstairs and Sarah isn’t there. She comes out from taking a shower and Emily hugs her. Hannah wants to know who made the call of Andrew is in jail. Pam comes in and tells the girls Andrew is free as a bird because they can prove he didn’t do it. They all realize this means whoever did it is still out there. Aria ask when he was releases. Pam say she hasn’t bee yet it will take a few hours. Spencer ask why Aria asked about Andrew. Aria says because if he was he could have made the call. Hannah says well he wasn’t so now what. Jason is with his dad just watching him. 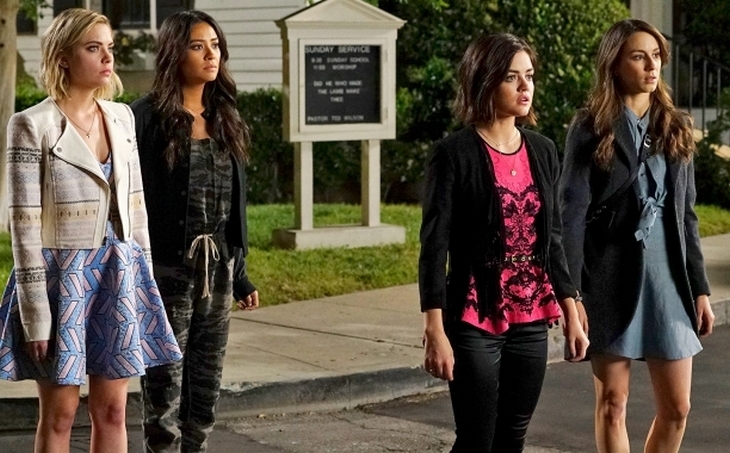 The girls are with Alison and she ask them if they know how crazy they sound. Hannah says we do. Aria says Jason never told her about Charlie. Alison tells her no. Spencer says her dad knows all about it and that he told Jason Charlie had to go away. Hannah tells her that her dad lied to her. Alison tells them Jason always said something was missing from this family and she assumed he meant himself. Alison brings up the missing pictures in the photo albums. Emily ask of they might be able to find proof in the house. Check the piano…. Spencer reminds them they have already looked through the house. They are tearing the house up. Hannah is making excuses to Dr. Sullivan and Emily is messing with the piano. Hannah tells her she will call,her in the morning. Alison is going through the flowers in the yard with Spencer. She tells her how much Toby isn’t going to like this because he wants to go back to hating her. Spencer says he doesn’t hate her. Alison brings up Lorenzo. Alison says he is nice. Spencer says Toby likes him. Spencer ask where she met him. Alison says once with Toby and then the other time at church. Alison instructs Spencer not to laugh. Spencer says she’s not she is just a little bit surprised. Alison says it’s pointless anyway. Spencer tells her there is a version of this where they all could have been killed by they weren’t so it’s like a second chance. Spencer tells her she doesn’t know anyone who couldn’t use one of those. Aria finds the clue if you can believe it. It’s a picture. They have the picture and Spencer says it’s the same image from the home movie in the dollhouse. Hannah says so one of those boys is Jason …..Aria says and the other one is Charlie. Alison says she doesn’t remember him. Alison tells Aria she is smart for looking in the button jar. Aria says she used to hide her candy money from Mike in hers. Alison tells them her dad is going to be home soon and they should go. Alison says she will find out what going on and then call them. They leave. They are walking home when they see Andrew who has jail been released. Aria is all about running over there. Andrew chews her out. He tells her the three weeks he was missing he was looking for her because he wanted to help her. Andrew tells her to stay away from him. Toby offers him a ride. He says thanks but no thanks. Andrew gets the parting shot and leaves. Toby says so I guess you heard. Spencer introduces herself to Lorenzo. She introduces the rest of the girls and says they are Alison’s friends. Lorenzo says it’s nice to meet them. He and Toby head in to the station. Aria looks as bad as she feels. Spencer says he won’t blame her forever. Aria says why not. Spencer says he was set up. Aria says they all were. Aria says they are more cut off then ever. Spencer says that’s what Charles wanted to do to them. Hannah talks about the game she had to play with the switches. Aria said she thought she was the only one. Aria said she was never shocked. Neither were the others. Hannah says he tricked them. Spencer said Charles wanted them to know there was a point when they would do it…any one of them. Spencer comes home to Sarah who has cut all her hair off. Veronica pits the smack down on Spencer and tells her she has to know where she is at all times. Veronica tells her Andrew told the police the girls tricked him into helping them and she ask her if it’s true. Spencer says just because it’s made up of facts it doesn’t mean it’s true. Spencer tells her mom not to try and catch her in a lie. Veronica tells her she is just trying to keep her safe. That if it wasn’t Andrew then whoever it was is still out there. Spencer tells her mom she thinks that she would rather have had it to never have happened at all but it did. Spencer says she Jair kept thinking when she was down there if they could just get out and get home everything would be ok. Now she is home and she doesn’t see the happy ending coming anytime soon. Spencer tells Veronica goodnight and goes upstairs. Hannah is looking at paint swatches to figure what color to paint her room. Aria is taking pictures. She sees the doll and takes a pic of it. Alison puts the picture back in the photo album. Jason comes in and Alison shows him the picture. Spencer takes the stolen pill and lays down. Jason and Alison are waiting for their dad. Jason tells him they have questions and they want answers not lies. His dad gets all huffy and tells him not to talk to him like that. Alison tells him he isn’t going to get out of it by picking a fight with Jason. Alison shows him the picture and ask who the other boy is in the photo. Their dad sits down. He tells them but all we hear is Jason and Allison say what. A is watching through the window. How the hell do they not see him standing there?